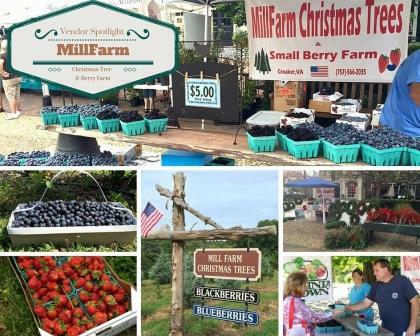 Millfarm Christmas Trees and Berry Farm, located minutes from Williamsburg, is one of only a few tree farms in Southeastern Virginia. Bill Apperson spent his career in the Virginia Department of Forestry and credits his career as a forester with kick starting the Christmas tree endeavor over forty years ago. Using extra greenery and a deciduous holly called “Winterberry”, the family offers greenery and wreaths to their customers both at the farm and at the Williamsburg Farmers Market. After Christmas, they plant nearly three thousand new trees next to the old cut stumps and are hard at work on the small fruit side of their business. The farm property once housed an orchard, and after Bill grew trees for a number of years, he chose to put some of the land back into fruit production in the form of blueberries, blackberries, and strawberries. Fruit harvest is mostly a pick-your-own affair, but the family takes a portion of the fruit crop to the market, where local berries are wildly popular. Bill and Mary pride themselves on three things—quality product, good service and affordability. Millfarm is not just a shopping experience—it is a family tradition.